Clackamas, OR – Warn Industries, the frontrunner in truck and SUV accessories, is excited to release a revolutionary new winch for trucks and SUVs. This product features the longest duty cycle of any electric winch on the market and the fastest line speed in its class, making it a performance powerhouse! Introducing the WARN® Endurance 12.0. The Endurance 12.0 features 12,000 lbs. of pulling capacity, a mid-frame design, and an innovative forced-air-cooling system for increased performance. Here’s how it works: The specially designed cooling fan (which is remotely mounted under the vehicle’s hood) automatically turns on when the winch’s motor reaches a certain temperature; it can also be manually activated. The fan sends air through a hose running into the winch’s motor housing, cooling the motor. The air then flows out of the motor housing via a second hose and the air is discharged. The Endurance 12.0 has other outstanding features including a contactor for increased durability and reliability, and a high-speed, three-stage planetary geartrain for fast, smooth, and dependable operation. For the ultimate in good looks and corrosion resistance, the winch wears a durable, glossyblack powder-coated finish. Much of the hardware, including the clutch lever, is stainless steel for added protection against the elements. 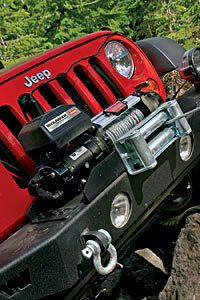 The Endurance 12.0 also features top-of-the-line winch sealing designed to keep water out. Other features include 80’ of 3/8” diameter wire rope; a mechanical brake; a remote with a 12’ lead and fan-activation switch; and a separate control box for a wide array of mounting options. 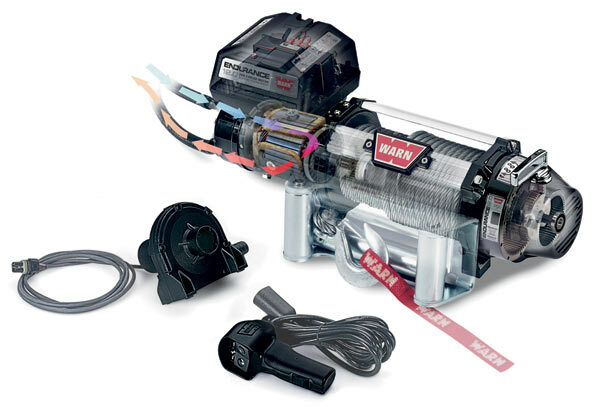 And, because this is a WARN winch, it has a limited lifetime warranty backed by a world-wide service organization. When you want a winch that’ll go the distance, you want a winch with serious endurance: The WARN Endurance 12.0.